Glycerin (glycerine, glycerol, 1,2,3-propanetriol) is a polyhydric alcohol mainly derived from the production of soap and in the conversion of fats and oils to fatty acids, fatty alcohols, or fatty acid methyl esters (biodiesel). Almost all crude glycerin is further processed to refined glycerin, but only vegetable-based products can be refined into high-quality products for personal care, oral care, and food uses. As a result of the significant increases in biodiesel production, crude glycerin has become abundant and the resulting oversupply has led to an increased amount of glycerin being consumed as crude. Crude glycerin can be consumed directly in animal feeds, for freeze protection for coal, as a dust suppressant, and in grain storage, but when the market is oversupplied and prices are low, the crude product is often burned locally for energy. The abundance of crude glycerin has given rise to a new grade of glycerin that is equivalent to USP quality but does not meet USP certification requirements. This technical-grade glycerin is consumed for industrial uses, such as the production of epichlorohydrin and propylene glycol. Asia will continue to be the center for refined glycerin in both supply and consumption, with the region accounting for more than 40% of the world total in 2017. 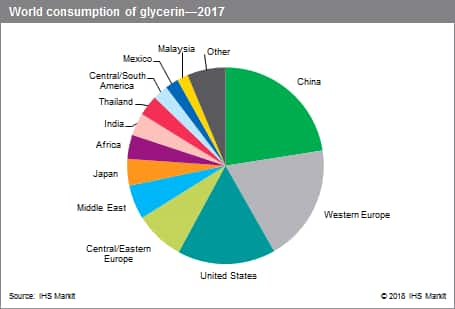 Regional consumption is led by China, which has experienced high growth rates as a result of the expansion of glycerin-to-epichlorohydrin production. While alkyd resins and toothpaste have traditionally been the major markets in China, rapid growth in pharmaceuticals and polyether polyol production will lead future growth through 2022. Thailand will also experience high growth rates as a result of epichlorohydrin production, while growth in India will be driven by more traditional markets (personal and oral care products). Both Indonesia and Malaysia will continue to export large amounts of refined glycerin, thanks to their abundant palm oil supplies. Japanese refined glycerin consumption is expected to remain about the same in the next several years. By end use, traditional markets account for half of refined glycerin consumption. Personal and oral care products are the largest refined glycerin market in the world, with about 30% of the total consumption. This category includes personal care items such as cosmetics and skin care products and oral care products such as toothpaste and mouthwash. It is followed by food and beverage consumption, with over 13% of the total refined glycerin market, and pharmaceuticals, with over 10% of the total. In general, the markets listed above are expected to increase in volume usage over the next few years, but will decrease as a percentage of the overall refined glycerin consumption total. The same is true for smaller applications such as polyether polyols and tobacco. Refined glycerin use for most of these market segments is expected to grow at about 4–5% per year. The highest growth for refined glycerin will be in chemical production and “newer” uses, which will drive overall consumption growth. Refined glycerin consumption for epichlorohydrin production is expected to show the largest growth through the forecast period; this use is currently only in Asia and Europe. Crude glycerin supply is now greatly dependent on biodiesel production, and is expected to fluctuate because of an increasingly uncertain market for biodiesel. Issues pertaining to industry subsidies, rebates, sustainability, and government legislation mandating biodiesel consumption are still being discussed in many regions. The outcome of these discussions will likely affect the profitability of the biodiesel market and whether it can survive with no or minimal support from governments. Additionally, demand for biodiesel is affected by prices for diesel and the cost of oils/fats feedstocks. Although it is expected that crude glycerin volumes for further refining will increase, erratic supplies could hamper development and allow for unacceptable price fluctuations, leading to some replacement of refined glycerin by other products such as sorbitol or propylene glycol. When glycerin prices are low, it can be used preferentially in some end uses over competing products (e.g., ethylene glycol, pentaerythritol, or sorbitol). In recent years, because of the emerging market of renewable diesel (which competes with biodiesel, but the production of which does not generate glycerin), as well as the shift of focus in biofuel policies, crude glycerin supply growth may have plateaued in both European and US markets.